Agi and Zoli Rubin are two survivors still able to share their past tragedies and the memories of their departed loved ones. They survived completely different horrors during World War II, met in Detroit, fell in love against the wishes of their families, and raised a family. Though they never forgot their pasts, they were able to prosper in America, forever haunted by their losses, yet always grateful they were given a chance to meet each other and live nearly 60 years together. It may be rare to witness such a Holocaust love story, one that has lasted as long as this one. On August 18, 2011, Agi and Zoli Rubin plan to celebrate their 60th wedding anniversary. Zoli, who had immigrated to Canada thanks to a farmer who had once been helped by Zoli’s father, had been engaged twice before but had not married. Agi, he thought, was good looking but she already had a boy friend from Ann Arbor. When she and her boyfriend and Zoli were invited to the same wedding, Agi decided not to go, unable to decide between the two young men. Her boyfriend met Zoli at the wedding and called Agi afterward to come over her house. Zoli couldn’t believe her boyfriend’s chutzpah and Agi was also not impressed either and chose the Canadian. It was hard to find work after the war but Zoli finally found a job at the Midwest Woolen Co. on Randolph Street. The owner gave him $50 the first day when he showed the owner what a hard worker he was. And when they needed a cashier, Zoli told his boss about Agi and she was hired right away. When they eventually engaged, Agi and Zoli both got letters from their closest relatives, questioning their decisions and telling each of them to look for someone wealthier. They never listened to their families’ requests and finally got married in Detroit on August 18, 1951. Agi and Zoli Rubin didn’t talk much about their history for much of their married life together. However, they courageously volunteered to talk about their pasts for the Voice/Vision Holocaust Survivor Oral History, Zoli in January 1983 and Agi in December 1984. (Both can be found online at http://holocaust.umd.umich.edu/). Zoltan was the youngest of eleven children, including his eight brothers and three sisters. In the interview, he fondly spoke about the “small village” of about 25,000 people in Czechoslovakia where he grew up. His father, a very “religious man,” ran a flourishing large farm, flour mill, and saw mill while his brother ran a chemical factory which produced toothpaste and prescription drugs. Like Abraham, Zoltan’s father kept his doors open for everyone, for people to pray in his house. And his father would always buy something from a traveling salesman because “this is his bread,” advice Zoli followed years later in his own business. In the late 1930s, after children starting being deported, his brother was taken and then another older brother but his wealthy parents were considered “important” and exempted for awhile. 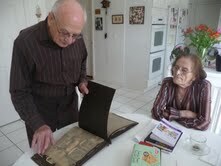 Zoli was fortunate to get gentile papers from a friend from school that helped keep him alive. (Zoli still has the papers of citizenship and birth certificates from his friend who gave him gentile papers.) His parents were desperate for their youngest child to survive but they didn’t want to live under gentile papers. When soldiers came to his house, his father told Zoli to hide in the Sukkah between the roofs and “kim nisht herinter,” (don’t come down,) were the last words he ever heard from his mother. His parents were taken to Zilina in Slovakia but this didn’t stop Zoli from trying to save them. Zoli got a letter of release and went to get money and jewels that his father gave a convert to hide for him upon his return. When Zoli went back to their house, he was told money and jewels were no longer there. He convinced one of his brothers to return to his home and search the basement when the German guard was at church. After three hours of searching behind the stones, a distraught Zoltan and his brother finally gave up. Even without the extra money, Zoli was still able to get a release for his parents and brought it to Zilina. He heard his parents’ names called but another family was instead released as his parents had already been sent somewhere else. A man who called Zoli’s father Uncle Mendel had sent his parents away and took bribes for himself. Rubin ended up joining the Slovak uprising to fight the evil he had witnessed. But the German soldiers captured him as well as many others and those without ID cards were instantly killed. A Slovak who knew Zoli threatened to tell on him but Zoli told him in a moment of exhaustion, “go ahead and tell them I’m Jewish.” Fortunately, the Slovak and Zoli were separated and his secret was safe. Years later, Zoli’s granddaughter wrote in a school project that cigarettes are extremely deadly and yet, they helped keep her grandfather alive. Cigarettes, she wrote with astonishment, are able to take away life but at least for one moment, they were able to save a life. After the war, Zoli and his surviving brother from Persia went back to his parents’ house and found the money he had searched for during the war within a few minutes. At that moment and for most of his life, Zoli has wondered, “Why didn’t I find it the first time I looked?” Living with this indescribable guilt that he failed to save his mother and father’s lives, he can barely stop the tears from dripping down his eyes. It’s been almost 70 years but Zoli’s voice quivers when he speaks of the agonizing days and unbearable losses. He estimates that about 70 members of his extended family died but fortunately, he was able to save a remarkable photo album from his Czechoslovakian home and bring it to America. An amazing treasure trove of family photos and letters from his family’s past, it is a testament of a profound legacy. There are photos, still in excellent condition, of Zoli’s parents and siblings, aunts, uncles, nieces, and nephews. This is a picture book filled with memories and evidence that once upon a time in Europe, life was good. In her book, Reflections: Auschwitz, Memory, and a Life Recreated, with Henry Greenspan, she writes how she was chosen to help sort the clothes of those who had been gassed and killed. Imagine a young girl having to sort the clothes of the dead rather than being killed herself. Imagine recognizing your aunt’s jacket in the leftover clothes and knowing that someone you love has just been exterminated, a few feet away. Imagine sorting the jewelry, shoes, hair, and clothing and realizing this was all that was left of her brother and mother. Agi wrote about Birkenau in the summer of 1944, “I will never forget the sounds. There was singing, Ani Maanim, ‘I believe in the coming of the Messiah.’ There were shouts of farewell—parents saying goodbye to children, old people saying good-bye to their families, a whole community saying good-bye to life. The Sh’ma, ‘Hear, O Israel.’ The end of the Sh’ma. The end of everything. Silence screaming just as loud. Unlike her husband who goes every week to synagogue services, Agi rarely attends services anymore. Agi and Zoli’s parents sent their children away to save them. Yet, Agi and Zoli’s devastating memories, their books and framed photographs, the letters and artwork saved from their childhood, still haunt them over 66 years later. Even though tragedy brought Agi and Zoli together, they have persevered with little bitterness and anger. They know what they’ve lost but they are thankful for what the gifts of their lives have brought them. The Rubins worked and lived in the United States in the Detroit area and started a family and made many friends in their over-60 years together. They raised three children together, Vicki, Amy, and Randy, and were fortunate to have been given seven grandchildren as well. Agi and Zoli have lived a modest, devoted, and love-filled life for 60 years. After all those years together, they still talk and share and aren’t afraid to face the past horrors of their lives together. Zoli worries when Agi doesn’t feel well and Agi feels the same way. Agi and Zoli’s parents, siblings, and extended family would have been very proud of the kind of lives they have lived after enduring such atrocities, the examples they have set for their children and grandchildren. Zoli Rubin smiles when he says he will live to 100. He comes to Bnai Moshe synagogue usually for morning services on Monday and Thursday and Shabbat and often leads prayers for the service, even though he is over 90 years old. Though he lived through some of the most horrific years in Jewish history, he still believes in God and faithfully says Yahrzeits for every member of his family in loving memory. In a world filled with cruel leaders, genocide, and anti-Semitism spreading around the globe, it is remarkable that two survivors have been together for 60 years. Agi and Zoli are a loving couple who have never given up on each other, their friends, their families, and who have never stopped believing in the potential goodness of people. Every year, we lose thousands of survivors. But we should be thankful for those still alive who are still here to cherish. We can still be inspired like Agi and Zoli Rubin, when remembering their mothers and fathers, to have our spirits singing together. Hear the harmony of Jewish voices rising above grief and loss. I am Henry Greenspan, who worked with Agi on her book, _Reflections_. That was Agi. We all miss her.